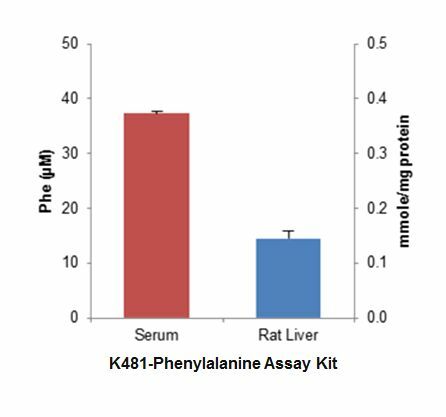 Phenylalanine Assay Kit | BioVision, Inc.
MILPITAS, Calif. - Feb. 21, 2018 - PRLog -- L-Phenylalanine (Phe) is an electrically-neutral amino acid, one of the twenty common and one of the three aromatic amino acids building the polypeptide backbone. Phenylalanine uses the same active transport channel as tryptophan to cross the blood-brain barrier, and, in large quantities, interferes with the production of serotonin. Errors in Phe metabolism lead to phenylketonuria or PKU which can have dire consequences. BioVision's Phenylalanine Assay Kit (Colorimetric) provides a quick, simple, accurate method for quantifying Phe in biological samples. In the assay, Phe is metabolized with the simultaneous formation of NADH which reacts with a probe to generate absorbance that can be followed colorimetrically at 450 nm. The assay is linear in the range from 0.2 to 10 nmol, allowing accurate determination of concentrations in the range of 1 - 50 µM Phenylalanine. Figure: Determination in liver lysate and serum: Liver tissue from rat and human serum were prepared according to the protocol. For Phe determination, 10 µl liver lysate (1.5 mg/ml) and 80 µl tyrosinase-treated serum were used. • Convenient: minimal sample preparation, fast protocols. • Simplest yet sensitive series of assays in the market!! BioVision, Inc. is a privately held Life Science company headquartered in the beautiful San Francisco Bay area. BioVision develops and offers a wide variety of products including assay kits, antibodies, recombinant proteins & enzymes, and other innovative research tools for studying Apoptosis, Metabolism, Cell Proliferation, Cellular Stress, Cell Damage and Repair, Diabetes, Obesity and Metabolic Syndrome, Stem Cell Biology, Gene Regulation, Signal Transduction, and more.